FORCELLA: ROCK SHOX RECON GOLD 29" SOLO AIR 100, bloccabile. COMANDI CAMBIO: SHIMANO DEORE, 2x10. GUARNITURA: SHIMANO DEORE M617, 38-24. CURVA MANUBRIO: KTM TEAM FLAT, 700mm. ATTACCO MANUBRIO: KTM TEAM 7°. FRENI A DISCO IDRAULICI: SHIMANO M425. 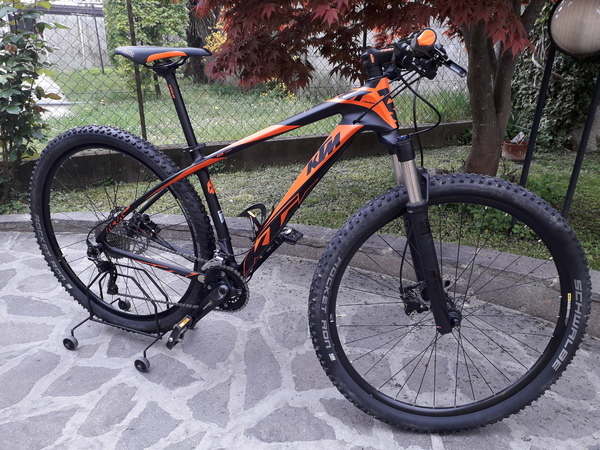 RUOTE: CERCHI KTM LINE CC 29". SELLA: SELLE ITALIA X1 FLOW.